As I’ve mentioned before, the binary opposition between synthetic and organic life presented in James Cameron’s The Terminator is complicated by the series’ second film, Terminator 2: Judgement Day. What was once a dialectic struggle between man and machine here becomes a messier conflict wherein one of the created machines is employed on the side of man as a protector. The message is no longer simply that a natural life is ethically and environmentally preferable to one that blindly embraces technology, but rather that technology can function either as a means to protect humanity from itself or act as an agent that assumes any shape it can to, we’ll say, severely retard its quality of life. Picking up years after the events of the first film, Terminator 2 opens with the messianic – and quintessentially early 90s – John Connor, Edward Furlong, living rebelliously with foster parents while his mother, Sarah Connor, Linda Hamilton, has been institutionalized in a mental health hospital for her “delusions” about the existence of the Terminator and, you know, time travel more generally. Here another of the film’s complications of the series’ original dialectic arises: Sarah’s fight to preserve the natural order of family resulted in her being institutionalized and her son being placed in the artificial protection of a created family. The film’s ambivalence toward John’s foster parents – in their truncated screen time – leaves one with the sense that while they are not overtly bad people, per se, there is an element missing from John’s life due to the absence of his biological mother. As with many of the binaries that crop up in the first two films, Cameron gamely challenges this initially simple opposition through the course of the film. Cleverly framing the arrival of this film’s time travelling pair in a manner that loosely echoes the events of the first film, Cameron is able to generate a tension in the viewer, playing with the appearances of the T-100, Arnold Schwarzenegger, and the T-1000, Robert Patrick, against expectation and experience. The T-100, the antagonist of the last film, is immediately recognized as a threat while the T-1000 appears slighter and dons an identity associated with the police upon its arrival. In the same way that The Terminator generated tension by maintaining the ambiguity of the roles of the two entities sent back through time, Terminator 2 establishes an uncertainty about the intentions of the two Terminators as they look for the Guns N’Roses blaring, dirk-bike, riding John Connor. The film’s soundtrack also plays into this dynamic, reintroducing the T-100 with the same menacing drone leitmotif that was present in The Terminator before shifting this to accompany the T-1000 when the roles become clearer. What follows is structurally similar to the first film: evade the machine chasing the imperilled Connor while working to ensure that the events demanded by the future transpire. The odd couple of Connor and the T-100 rescue Sarah from her institution before she decides that the best way to prevent the future apocalypse would be to kill the man responsible for the creation of the militantly self-preservationist A.I. Skynet in the future. 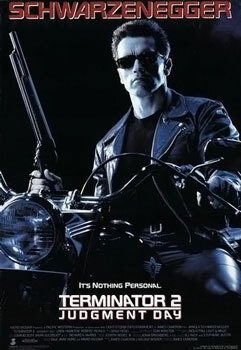 Again, Cameron’s film works to invert the basic relationships of his film by positioning Connor in the role of the Terminator, working to prevent future events by amputating their agency in the past. Crucially, however, Connor’s humanity intervenes, preventing her from doing much more than destroying Dyson’s office and non-fatally shooting him in front of his wife and young child. Nothing we all don’t see on a weekly basis. The group’s mission here becomes the destruction of the temporally dislodged artifacts from the first film; if Dyson’s research, and the future technology on which it is based, is destroyed then the future cannot come to pass… right? Along the way John takes up the task of educating the T-100 on the colloquial and social norms of 1991. This relationship provides the film with much of its humour and heart, allowing it to resonate on a level beyond the frenetically visceral pace of the first film. This relationship also demonstrates that a non-organic (literally and figuratively) familial apparatus can be successful where the foster family from the film’s earlier section intimated otherwise. The film culminates in a factory setting in a manner similar to that of the first film, foregrounding the action against a backdrop in which humanity employs the machine to create. This factory setting is less unilaterally a metaphor for the control of machinery, however, as it now also gestures toward the subjugation of the artificial intelligence of Skynet that instigates the war in the first place. The form of the T-1000 presents a similarly less direct representation of the threat posed by technology. Composed of a “mimetic poly-alloy” liquid metal, the T-1000 presents a threat that can change form, adapt, and present itself in any form it comes into contact with. Read allegorically, the T-1000 presents a more amorphous representation of the threat technology poses; technology no longer solely threatens to alienate and mechanize humanity – the vision of the negative effect if technology posited by the limited humanoid form of the T-100 – but to adapt and assimilate any humanity it comes into contact with, to reduce humanity to the level of its “tools”. Indeed, the form of the T-100, combining a metallic endoskeleton overlaid with organic skin, in the context of this film gestures toward a more symbiotic relationship of the organic and synthetic. The T-100’s physical form actualizes the bonding gestures of care and communication enacted by it and John Connor. Capped by an eminently sentimental ending where the T-100 is able to circumvent its protocols forbidding self-termination, Terminator 2 superficially posits an uncertain future where the preceding events may have effected change. Logically, however, the film has to have merely follow through the events necessary for its reality to come to pass. The indeterminacy expressed by Sarah Connor’s voice over, progressing along the black highway of time, is hopeful but illusory. The way forward necessarily involves a synthesis of organic and artificial elements; the true hope of the film lies not in its presumptive victory of the humane, but rather in its demonstration that these disparate elements are able to inform one another in beneficial ways, that they need not exist as mutually exclusive modalities of being. All of this perfectly summed up in the T-100’s final and sublimely cheesy gesture.